Formula One returns to Europe for the next leg of the 2017 season, with the Spanish Grand Prix set to kick things off at Barcelona. It’s a track everyone is familiar with, after mountains of testing completed in and out of season around the circuit, but it can still offer up a surprise or two. The last race wasn’t a spectacular event in and of itself, but it added to the narrative of the season – a story that is really starting to get interesting. What can Barcelona bring to the plot? If you were starting to think that the 2017 season was going to be a two-horse race, then Valtteri Bottas did all in his power to prove that he’s part of the competition this season. He dominated proceedings in Russia, winning his first race in Formula One and showing that he’s not set to roll over and let Lewis Hamilton become a number one driver at Mercedes. But both of them have some work to do to keep up with Sebastian Vettel, who is leading the world championship having two race victories of his own. And what of the rest of the field? We’ve got a superbly strong Force India so far, and a disappointing performance from Red Bull. We’ve got a Williams team desperate to show some grit and spirit, and a Renault squad that are really struggling to compete. Towards the back, we’ve got Fernando Alonso, who will participate in his final race before heading over to IndyCar for his one-off drive. It’s his home event too, so expect plenty of passionate fans to be cheering on that ailing McLaren – if it manages to start the race. Support racing for this event includes FIA Formula 2, GP3 Series and Porsche Mobil 1 Supercup. The European leg of the F1 season usually brings with it some changeable weather conditions, but things are looking pretty sunny and stable for the coming race weekend. It’s forecast to be dry on Friday for practice, with the risk of showers gradually rising over the next few days, but all in all it’s expected to be sunny skies and mid-20s in terms of temperature. The first thing any F1 fan will tell you when discussing the Barcelona track is that it’s the one everyone knows the best. It’s true that teams do have a lot of data from around the circuit, but this year’s changes might mix things up a little – tyres that aren’t acting quite as expected, along with cars that run closer and make overtaking more special, well we can all do with more of that. Overtaking isn’t always easy around the Circuit de Catalunya, but the racing is usually interesting nevertheless. 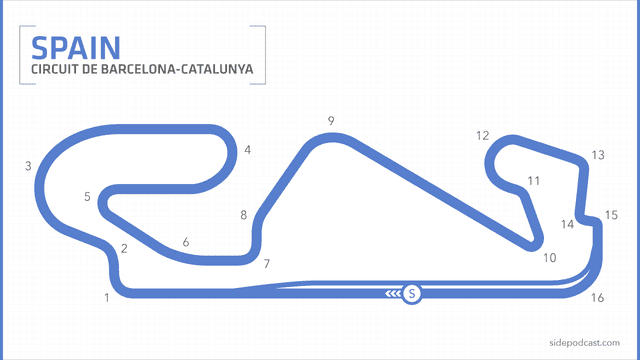 The reason the Barcelona track is used for testing is that it has a nice mix of corners and is quite a technically demanding layout. A lap begins with the downhill ninety degree right hander, that represents the main opportunity for overtaking. Turn two sends drivers back to the left, and the circuit then arcs all the way round a long, sweeping right hander taken in fifth gear, to lead onto a short straight. A 180 degree turn starts the second sector, leading to the more complicated mix of corners on the midfield. Drivers head up and away from the paddock along two straights joined by a swift ninety degree sixth gear corner. The final sector is even more tricky, with a mix of third to fifth gear corners, and that final difficult chicane. After navigating that, the drivers sweep around the super fast final right hand curve to head back onto the home straight and get the speeds back up again. This year sees the 27th Spanish Grand Prix held at this track, with its debut coming in 1991. There are six current race drivers that have won the event, with two of them winning multiple times (that's Kimi Räikkönen and Fernando Alonso, if you're curious). Ferrari are the most successful team around this track, which may be a record added to this weekend. McLaren are second in line, and it's fair to say that probably won't be affected this weekend. Max Verstappen took race victory in Spain last year, which saw him become the youngest race winner snatching the record from Sebastian Vettel. Barcelona is also the site of the unusual race victory by Pastor Maldonado, who won in 2012 driving a Williams. The Williams team celebrate their 40th anniversary this weekend. Ahead of this weekend's race, there hasn't been a lot of changes to the circuit except some upkeep of the artificial grass (it's been removed at some of the corners), and some additional kerbing aimed at both the F1 cars as well as for MotoGP events. Pirelli are bringing the hard compound to Spain, which seems like an overly cautious approach considering how durable the 2017 rubber has been. Teams and drivers are still running to the mandated number of each compound this weekend, the last weekend that happens before back to free choice from Monaco. Garry Connelly Deputy President of the FIA Institute, Director of the Australian Institute of Motor Sport Safety, F1 and WTCC Steward, and FIA World Motorsport Council Member.